Editor(s): Schultz, G.; Buxner, S.; Shore, L.; Barnes, J. 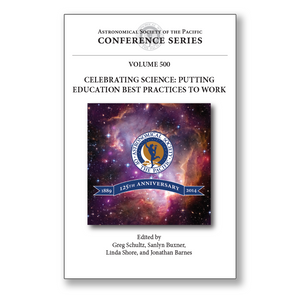 In August 2014, a community of science education and public outreach (EPO) professionals, astronomy instructors, scientists, formal and informal educators, science communicators, and others gathered at the Hyatt Regency in Burlingame, California, to share their knowledge and experiences around seven major conference themes: (1) Engaging with 21st Century Media and Technology, (2) Enhancing Science Communication Skills and Practices, (3) Evaluating, Assessing and Documenting EPO Impacts, (4) Improving Our Professional Practice, (5) Promoting Multicultural Diversity and Gender Equity, (6) Supporting the Next generation Science Standards (NGSS), and (7) Using Authentic Science and Citizen Science. This gathering of experts in science communication, college teaching, education research and policy, public science engagement, and K-12 science teacher professional development shared best practices, metrics, challenges, opportunities, and results. This volume serves as a record of the meeting and includes the transcripts and summaries of many of the presentations given at the conference.